What would independence mean for Catalan wine? 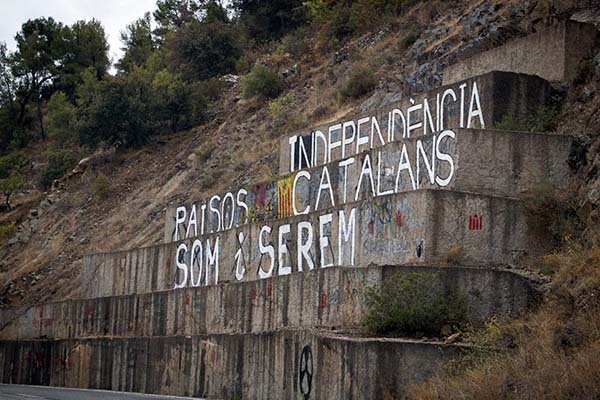 It’s important to note that despite 300+ years of Spain’s trying to eradicate the Catalan language and culture, even the staunchest of independentists don’t hate Spain. Salvador Batlle of natural wine cellar, Còsmic, in DO Empordà says it best, “Spain is an amazing place, but we have to be able to preserve our culture and language.” He was “born an independentist”, as were many winemakers due to the Catalan way of life never dying out among the “pagesos” or peasants in Catalonia’s village hinterlands. 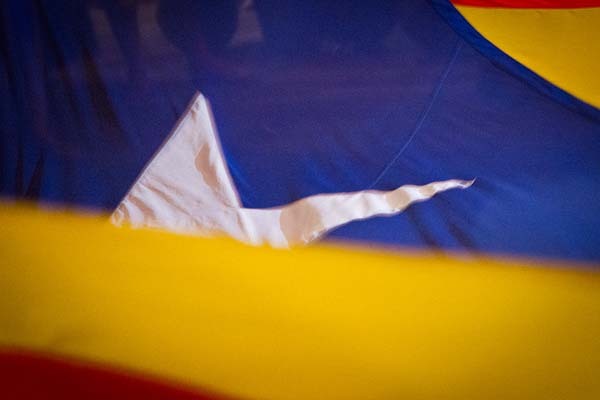 It’s no surprise that either publicly (like Salvador who has the estelada independence flag hanging in front of his winery) or privately, like the larger wineries that try to retain an official neutral stance, most Catalan winemakers are very pro-independence. People in rural, farming areas suffered the brunt of wars over the centuries and have long found that the Spanish state had little to offer and a lot to take. What’s changed recently is that the fight has been taken to the urban centers and more importantly, to the highest ranking Catalan politicians, who had tried the hear no independence, see no independence, speak no independence strategy for years. As something of an admittedly misplaced fart in their general direction, the head of the regional Catalan government in 2004, Josep-Lluís Carod-Rovira, called for Catalonia to boycott Madrid’s bid for the 2012 Olympic Games. The response from the rest of Spain was to boycott Cava, 95% of which is produced in Catalonia. It worked amazingly well and sales greatly slowed. This, along with many other problems in 2005 (such as ending Catalan language in schools and a massive tax imbalance) saw the Catalan Parliament take things one step further and enact a further autonomy statute that was an attempt to gain further rights within Spain. At this point the gloves came off and renewed Cava boycott saw sales drop by 7% for the year. This doubly hurt the Cava producers in Penedès, who are generally discreet on the independence question as they rely on sales outside Catalonia. The events from a decade ago have further solidified the resolve of winemakers, as they see union with Spain as a dead-end for their wines. Thankfully for them, there has been a huge rise in interest in local and regional products, compensating for the coolness of the wider Spanish market. For example, the DO Montsant winery, Venus la Universal, owned by husband and wife super duo, René Barbier (Clos Mogador) and Sara Pérez (Mas Martinet) sells 40% of its total production to Barcelona alone. Another example from DO Montsant is Ronadelles, whose Cap de Ruc (donkey’s head) wine has seen sales climb in the last five years. While it’s partly due to it being an affordable, easy to drink wine, it’s also in good part due to the fact that the donkey is the national mascot of the Catalans. Thus ordering a bottle not only supports a local wine but also puts a subtle salute to Catalonia on your table. If a referendum were to be held in November and the result were Yes (actually Sí and Sí due to it being a bizarre two question ballot) and Spain agreed to let Catalonia go, what would become of Catalan wine? Depending on whom you ask, it’s either a fantastic opportunity or a barrel of vinegar. According to Salvador at Còsmic, it would offer the chance to “show what is unique about Catalonia from grapes such as Garnatxa Roja and Trepat or from the great diversity of regions and styles that are like a micro France”. Owners Albert Costa and Lluís Llach (a popular singer who has also been a veritable icon in Catalan independentism for decades) of the classic and upscale Vall Llach don’t feel that much would change for them because they have a successful winery in the renowned DOQ Priorat. Priorat itself is a brand that stands out, much like La Rioja, from the rest of Spain’s wine landscape. There are other questions. Would Spain keep the name DO Cava, given that it’s the only denomination administered at a federal level? If Catalonia lost the name, it could be the moment that Josep Maria Raventós of Raventós i Blanc has been hoping for to reboot the Cava brand under stricter, more craft-oriented rules with his proposed, DO Conca del Riu Anoia or DO Conca for short. Spain has also stated that an independent Catalonia would have to re-apply for EU membership as it would be a new country. Many of Catalonia’s best customers would be harder to reach if it were outside the single market. But Spain would have a problem, too. Nearly all of its major roads and railways to Europe pass through Catalonia. If Catalonia were left outside the EU, even temporarily, there would be a hiatus. Quite apart from the loss of tax revenue, this is why Spain absolutely does not want to let Catalonia leave. Will it happen? No one really knows. But it might. In the circumstances, the best response is to open a bottle from one of the 12 Catalan DOs as soon as you can. That way you can say you knew Catalan wine when it was still Spanish. Previous post: Vin de France: the flexible future?